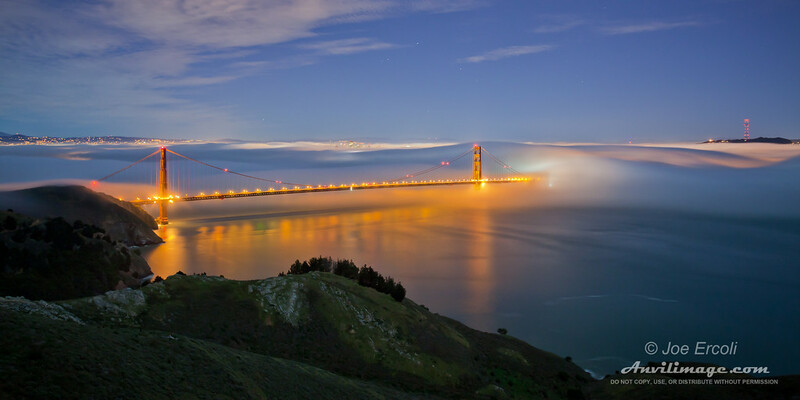 I’m still waiting for that elusive shot: the San Francisco Bay and Golden Gate Bridge completely covered in a thick blanket of fog with only the tops of the two towers peeking out. As many times as I’ve shot this bridge (many, many times! ), the conditions have never been just right. Last night I was at home when I realized that there was a full moon and I started thinking about how my street had been shrouded in fog the last couple of mornings. I quickly pulled up the web cam at the Golden Gate Bridge and checked out the conditions – It was covered in fog, or at least the toll booth area to the South was. I quickly called my buddy Tom to see if he wanted to make the drive up to The City that night to see what we could get. The fog was thick on the way to the bridge and my excitement was building, but it broke just about as we hit mid-span. We waited that night to see if the conditions would change but even though the fog seemed to ebb and flow like the tides of the sea, it never covered more than about a third of the bridge. The fog tempted and teased me like it was playing a game. “How long can I keep you here? How long will you endure the cold?” It was a waiting game to see who would break first and unfortunately, the fog won this time… Sleep beckoned. I’ll keep an eye on the conditions and I’ll be back. Someday, yes, someday that shot will be mine. Golden Gate Bridge 75th Anniversary Fireworks The Golden Gate Collection It’s Raining Stars! Pre-Dawn Adventure Night Image of the New San Francisco-Oakland Bay Bridge! This entry was posted on Thursday, January 20th, 2011 at 12:38 am	and is filed under Blog, Photos and tagged with fog, GGB, Golden Gate Bridge, long exposure, Marin Headlands, night photography, San Francisco. You can follow any responses to this entry through the RSS 2.0 feed.